What the Health lobs a bombshell into the typical American diet. Documentary filmmakers Kip Andersen and Keegan Kuhn set out to better understand the dangers of the foods we eat, propelled by Andersen’s own fear that he’d face the same diseases his father and other family members did: cancer, diabetes, heart disease. These diseases cast a ghastly pall that hangs over many Americans, making this book an urgent call to change. 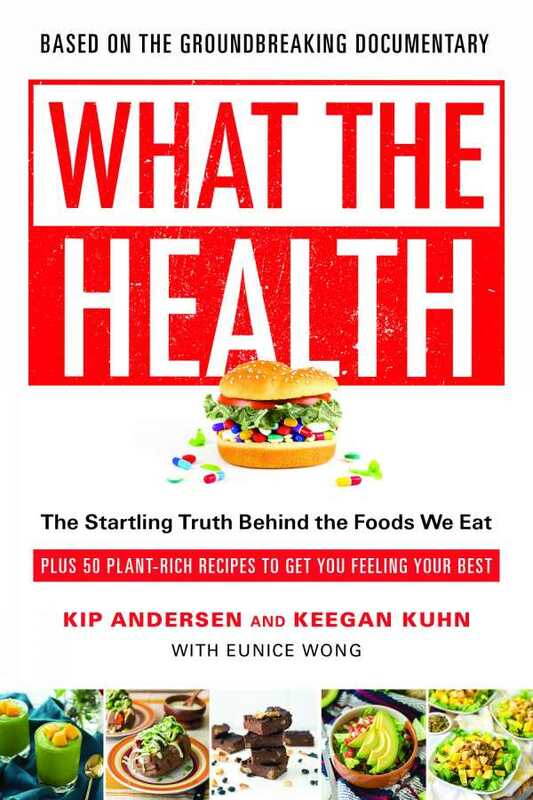 Building on the array of books and films documenting the dark side of the food industry and the disastrous impacts that our dietary choices have, Andersen and Kuhn uncover a simple yet transformative answer: a plant-based diet. The book shares the narrative of their research process: the twists and turns and roadblocks, the thrill and horror of discovery. This narrative, including its dialogue, makes the book easy to read and presents an accessible, inquisitive path to science. At first blush, the authors seem to rely on shock value. They compare eating saturated fat to smoking cigarettes and discuss the pus in cows’ udders from mastitis. But the deep research from which these seemingly outrageous claims are drawn leaves little room for argument. Most shocking are the industrial cover-ups that keep information hidden and the frightening effect this has on children. The book’s recipes bring the research into everyday life, answering questions like “What on earth do I do know?” They make drastic dietary changes sound downright appetizing, with Butternut Squash Steel-Cut Oats, Curried Rice and Lentil Stew, and Chocolate Avocado Pudding. Don’t read What the Health unless you want to change the way you eat—but if you do, the book presents a compelling path to longevity.